Assessment of a patient having an amputation should begin as early as possible, ideally preoperatively, by the whole multi-disciplinary team in order to prepare the patient, maximise the potential outcome of the procedure both surgically and functionally. In fact the decision to amputate should be made by this team where ever possible . This could even be before admission to hospital for the surgery, especially important if there are issues associated with wheelchair accessibility to / within the home and likely support required. Either pre-or post surgery it is of utmost importance to have a discussion with the patient about his/her short term and long term goals, as well as specific expectations and feelings they might have regarding the surgery, rehabilitation, etc. To assess the most appropriate level of amputation for the individual, not only according to tissue viability but also the likely future potential mobility the patient may have. For example: Is preservation of the knee joint paramount? Usually this would be the ideal in order to maximise function and future mobility potential but, if it is fixed in flexion and distally likely to be a pressure area if patient is not mobile maybe this is not the case. On the other hand it may still be worth preserving if the contralateral limb is also likely to require amputation in the near future at a higher level and the use of a trans-tibial prosthesis on the first side would facilitate independent transfers and safety in sitting. To prepare and inform the patient and their family / carers for the surgery, hospital stay and rehabilitation. Leaflets are available such as those produced by the Circulation Foundation on many areas such as peripheral vascular disease, intermittent claudication, angioplasty and stenting, bypass surgery and amputation to support local information. To discuss realistic potential level of mobility with patient, family and carers, whether this is likely to be using a wheelchair or prosthesis depending on the findings of the assessment. It is important to be open and realistic from the start in order to facilitate adjustment to their new situation and to minimise problems resulting from misinformation. Usually patients will experience a lower level of function following an amputation than previously, especially if having a higher level of amputation such as trans-femoral. To order appropriate wheelchair and stump board if needed so it is available as soon as possible. To optimise pain relief pre op and post op. Discuss pain relief and possible phantom limb sensation and pain post op. To refer to other members of the team as required such as Occupational Therapist, Psychologist or Counsellor, Podiatrists, Prosthetic service, Dietician, Specialist nurses such as Tissue viability or District nursing, Wheelchair services, Social services and other medical specialities such as Diabetology, Psychiatry, Elderly care, Neurology or Rehabilitation medicine. To offer support from other amputees if appropriate either locally or through national organisations such as The Limbless Association in UK and The Amputee Coalition in America or online support networks. To begin discharge planning - whether the patient will be able to return home or will need rehousing or adaptations to be made, a care package or admission to a residential or nursing home. To plan pre and postoperative physiotherapy intervention through the setting of realistic goals with the patient. Information can be gained from many sources as well as the medical and nursing notes, patients, carers and those involved in the patient's care prior to admission. Assessment is never a one off exercise but an ongoing process. See Clinical guidelines for the pre and post operative physiotherapy management of adults with lower limb amputation . Vasoactive drug treatment such as naftidrofuryl oxalate – recommended by NICE for treatment of leg pain triggered by exercise (intermittent claudication) in people with PAD. Patients expectations of planned surgery: For some it will be an elective amputation following a prolonged disability or period of treatment, for others it may be an acute episode resulting in an emergency amputation. Patients expectations may be well informed and realistic but not always. Sometimes they can be over optimistic as to the ease and speed of prosthetic rehabilitation, lack of discomfort, future mobility levels but equally they can sometimes be overly pessimistic and realistic plans and goal setting is essential. Psychological and emotional state: During rehabilitation the advice and support given by the team, family and others amputees are very helpful and means that they may not require specialist counseling but some patients do require additional support. Every patient’s response to their amputation will be unique. Their coping strategies or reactions may well change over their rehabilitation period and beyond and as therapists we need to be aware of possible responses that may be of concern such as denial, withdrawal, suppression, regression, projection and displacement. Timely referral is needed on to the appropriate specialty if required. Negotiation of environmental factors like stairs, ramps, uneven terrain, curbs, crowds, obstacles, etc. Cohabitants / dependents: age, health, ability to assist / care / support the patient or is the patient a carer? The physical assessment could be done pre- or post amputation and should be tailored to the specific patient. Moistness of area around the wound: a wet environment (like the dressing) might predispose the wound to infections, whereas a very dry wound may limit the healing process. Information about the quality of the residual limb (stump) as this will have an impact on the prosthetic rehabilitation potential for the patient. Wound condition, oedema, stump length, cut end of bone (prominent or not), skin perfusion, sensation, tenderness, stump shape, redundant tissue, mobility of scar and pain should all be considered. 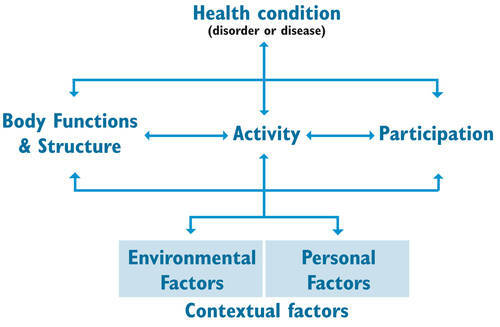 The functional impairments affect many facets of life including but not limited to: the activity of daily living, mobility, body function and structure. The introduction of the International Classification of Functioning, Disability and Health (ICF) by the World Health Assembly in May 2001 provides a globally accepted framework and classification system to describe, assess and compare function and disability. The article Portraying the amputation of lower limbs: an approach using ICF shows how the ICF could guide a multidirectional approach during the rehabilitation of a person a with limb amputation. In the World Health Organisation ICF Framework they included a specific "amputee element"
In order to evaluate the lower limb amputation rehabilitation outcome, the use of a measurement instruments will quantify those outcomes classified within the International classification of functioning, disability and health (ICF) category of body function or structure. "By incorporating outcome measures in daily practice clinicians can have the ability to evaluate the various aspects of clinical care such as level of confidence with the prosthesis, socket comfort, functional level and quality of life with the prosthesis. Outcome measures not only help clinicians to determine the effectiveness of an intervention but they can also detect the cause of the problem and in some cases provide directions on potential solutions and therapeutic interventions." Activities-specific Balance confidence scale- UK (ABC-UK); The ABC -UK is a self report, quality of life outcome measure, relating balance confidence to functional activities. The Amputee Mobility Predictor (AmpPro / AmpNoPro): is an instrument to Assess determinants of the Lower-Limb Amputee's Ability to Ambulate and measure function post-rehabilitation. It was developed to provide a more objective approach to rating amputees under the various "K Classifications". The test can be performed with or without the prosthesis.The AmpPro form & instructions can be viewed here AmpNoPro (In Appendix 2 for instructions). Locomotor capability index questionnaire; the LCI is a self report outcome measure that forms part of the Prosthetic Profile of the Amputee questionnaire. The LCI assesses a lower limb amputee's perceived capability to perform 14 different locomotor activities with a prosthesis. The Trinity Amputation and Prosthesis Experience Scale (TAPES), is to examine psychosocial issues related to adjustment to a prosthetic, specific demands of wearing a prosthetic and potential sources of maladjustment. The Barthel scale or Barthel ADL index is an ordinal scale used to measure performance in activities of daily living (ADL). Each performance item is rated on this scale with a given number of points assigned to each level or ranking. The Prosthetic Profile of the Amputee (PPA) measures function of adult unilateral lower limb amputees (prosthetic users and nonusers) in terms of predisposing, enabling, and facilitating factors related to prosthetic use after discharge from the hospital. Clinical Outcome Measures for Rehabilitation of Amputees – A Review. Agrawal V. Phys Med Rehabil Int. 2016; 3(2): 1080. Many trans-tibial amputees will be able to use a prosthesis, even if it is only for transfers or to help with sitting balance or even for cosmetic reasons but a trans-femoral limb is very different so careful assessment is required as to whether the patient will be able to benefit from a prosthesis, particularly at this level. 1. Does the amputee want to walk? 2. Will it be possible for the amputee to walk? per e.g. : A hip flexion contracture of 15 degrees or more makes fitting a prosthesis difficult. 3. Where will the amputee walk? 4. Will prosthetic rehabilitation improve the amputee's quality of life? Transfer independently from a seat to bed/chair/toilet and back using a standing pivot transfer. Push up from sitting in wheelchair to standing independently in parallel bars. Have independent standing balance within parallel bars (patients may need to be able to stand for up to 5 minutes for prosthetic casting). Cognitively unimpaired i.e. be able to follow instructions, process new information and remember it over a period of time. (A CAPE assessment can be organised if needed). With the aid of an early Walking Aid (such as a PPAM aid or Femurette) mobilise within the parallel bars. The patient should be able to achieve 6-10 lengths, repeatedly, throughout a treatment session on a regular basis during their initial phase of rehabilitation. Example Amputee Physiotherapy Assessment Form (provided by Hull & East Yorkshire NHS Trust Physiotherapy Dept). Acute Care. Pre-operative physiotherapy. AustPAR. Australian Physiotherapists in Amputee Rehabilitation. Portraying the amputation of lower limbs: an approach using ICF. Gonçalves Junior E, Knabben RJ, Luz SC. Fisioterapia em Movimento. 2017 Mar;30(1):97-106. ↑ The Vascular Society of Great Britain and Ireland. 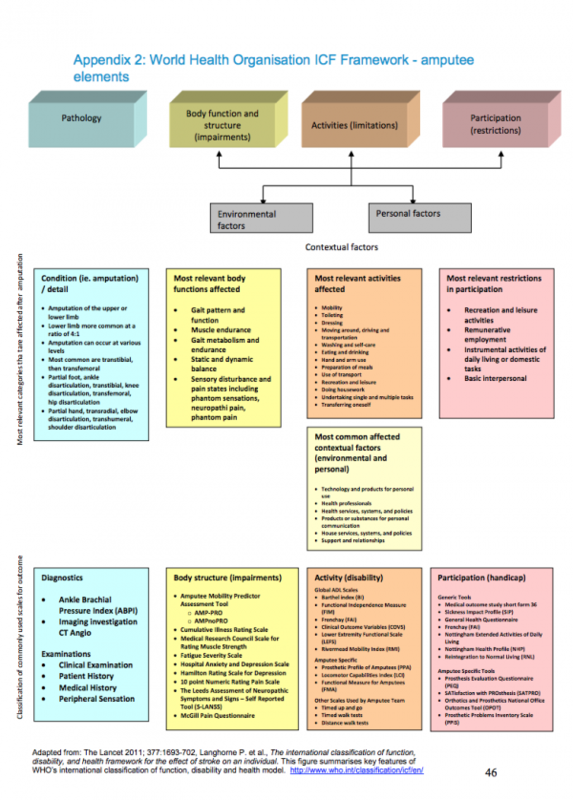 Quality Improvement framework for major amputation surgery 2010. Vascular Society of Great Britain and Ireland. ↑ 6.0 6.1 6.2 6.3 Murphy D, editor. Fundamentals of amputation care and prosthetics. Demos Medical Publishing; 2013 Aug 28. ↑ Bowker HK, Michael JW (eds): Atlas of Limb Prosthetics: Surgical, Prosthetic, and Rehabilitation Principles. Rosemont, IL, American Academy of Orthopedic Surgeons, edition 2, 1992, reprinted 2002.